While I am not in the slightest bit coordinated, I love sports. I love everything about it. And I especially love how it creates a sense of community and how during the field of play, it brings us back to our childhood and how dreams can be lived through the play of boys and girls, men and women as they play their games… how that competitiveness fuels us at an early age of the types of sacrifices needed to get better… The afternoon I met Cal Ripken Jr., he told our crowd, mostly a group of 20-somethings starting their careers, his perspective on sports and the role it played in his life. I remember what he said, the night he broke Lou Gehrig’s consecutive games played streak. His streak was a reminder to us of what it means to go to show up in life, every single day, and how just by being present, you can give yourself to realize the dreams you’ve always had. Anyways, I happened to also read this quote the other day that I originally wrote onto my journal at 10:05 PM on 5 April 2004 in Chicago, IL. 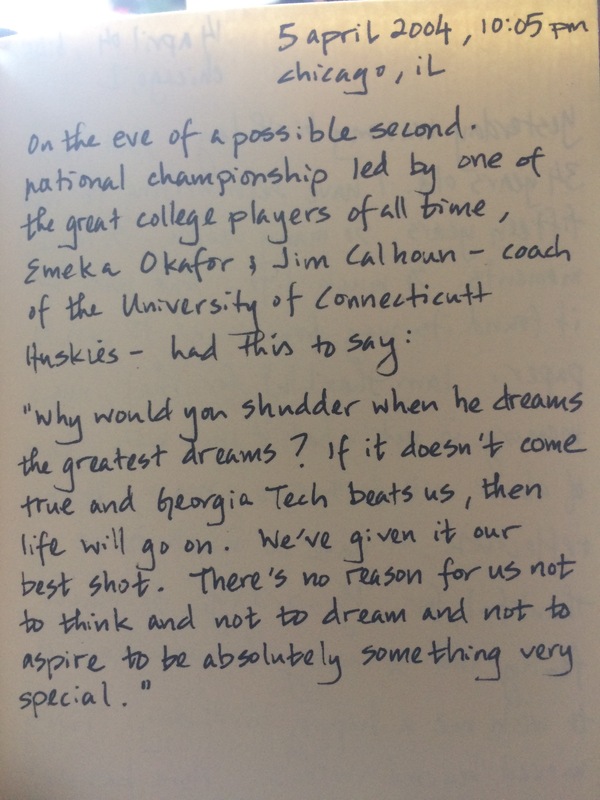 With the Final Four weekend upon us, it only makes sense that I happened to read this just now. The University of Connecticut would go on to win another national championship that year. With a thick New England accent, their coach, Jim Calhoun, actually said this on the day before the game. Why would you shudder when he dreams the greatest dreams? If it doesn’t come true and Georgia Tech beats us, then life will go on. We’ve given it our best shot. There’s no reason for us not to think and not to dream and not to aspire to be absolutely something very special.